Be sure to check out this post for more about why eggs are SO good for us. Also, before reading about whether or not it’s safe to eat raw eggs, first you probably wonder why you might consider doing so in the first place? The answer is the same reason raw milk is so good for us and why we shouldn’t cook the heck out of all our other foods, either: for more enzymes — for optimal digestion and assimilation of nutrients — and more nutrition in general. And by the way, I’m not talking about eating them plain, although some might want to (not me! ), I’m talking about eating them in something, like smoothies, real food protein shakes, homemade mayo, homemade ice cream or egg nog, and maybe in cookie dough now and then, Mmmm…) Not that you have to always eat them raw, because they're great for us cooked too, and good in sauces, etc., but you don't have to fear a raw egg yolk. Wondering about the cholesterol in eggs? Read more here about healthy fats and the big cholesterol MYTH. If you need raw eggs for mayo or something and you can't find a good source for healthy eggs, see this post from Hallee about how to pasteurize an egg. So are raw eggs safe to eat? According to most media reports, eating your eggs anything short of completely dried out and charred is tantamount to committing suicide. The little bug known as Salmonella might just take your life if you don’t thoroughly cook every bite of egg you take. This over-hyping from the media has ruined everything from Caesar dressing to the Whiskey Sour. The reality is that there is a 1-in-20,000 to 1-in-30,000 chance that any given conventional egg will be contaminated with Salmonella. You have a 1-in-1,000 chance of dying of accidental drowning and a 1-in-6500 chance of dying from a slip and fall. And since few cases of Salmonella actually involve death, I think this is a pretty unimportant concern. Unfortunately, we don’t have statistics on pastured or organic eggs, but I’m betting it’s lower since healthy chickens and healthy conditions are less likely to harbor the Salmonella bacteria. What About Raw Egg Whites? Raw egg whites contain an enzyme called avidin that acts as an anti-nutrient to bind biotin in the yolk. Also known as vitamin B7, biotin is instrumental in cell growth and the metabolism of fatty acids and amino acids, as well as blood sugar maintenance. Just like with most vitamins, it’s a bad idea to reduce their availability to the body. Chris Masterjohn is much smarter than I am, but personally I’ll keep eating gently cooked eggs with both the white and the yolk. This is based only on common sense: that’s how they come in nature. (Also read this excerpt from Nina Planck about egg whites and skim milk.) I have always heard, however, that you shouldn’t eat raw egg whites, and now I know why! So when making smoothies, real food protein shakes, homemade mayo, ice cream or egg nog, I’ll continue to use just the raw egg yolks. Does the thought of eating raw eggs gross you out? Is it because your Mom always said not to? Hi I just ate a little piece of raw French toast. Just wondering will I get sick or possibly die. Please answer ASAP. You are most likely just fine! Chances are very very VERY small that you’d get sick from that!!! No wonder you don’t like egg yolks Rosa, forcing a child to eat something is usually a good way to make them never like it again! I do not like the idea of eating raw eggs because as a child, I was forced to eat the egg yolk and it was not too tasty. I do worry about salmonella too. Living in Japan and seeing the amount of food served with raw egg, I have a hard time jumping on the ‘unhealthy’ bandwagon. They are served in rice, ramen, on natto, with sukiyaki, the list is large. The eggs are beautiful here. Golden orange and difficult to break the yolk. However, Japanese that live in America will not eat the American eggs, at least raw. Every Japanese I have heard of living elsewhere raises their own chicken(s) if they wish to eat them raw. Perhaps that is due to the Japanese perception that Westerners prefer profit over healthy chickens. Whether or not true, I have to say that quality needs not affect profit. The average cost of a batch of eggs at the market here is about 130 yen ($1.40). Seeing also as Japanese are among the longest lived people on the globe, I would argue that raw egg is more healthy than detrimental. A lot of people get chickens but do not read up on how to raise them. Chickens get worms and have to be wormed twice a year. I won’t buy farm eggs from people who have signs up along the road saying they have free roaming chickens eggs. Egg nog traditionally made with raw eggs has long been given to children and elderly that needed extra calories and nutrition due to illness. It is like custard before you bake it ;o) Most kids love it; just watch your sweetener. Found your website online and thought I’d post. I’ve been eating raw eggs for several years now. 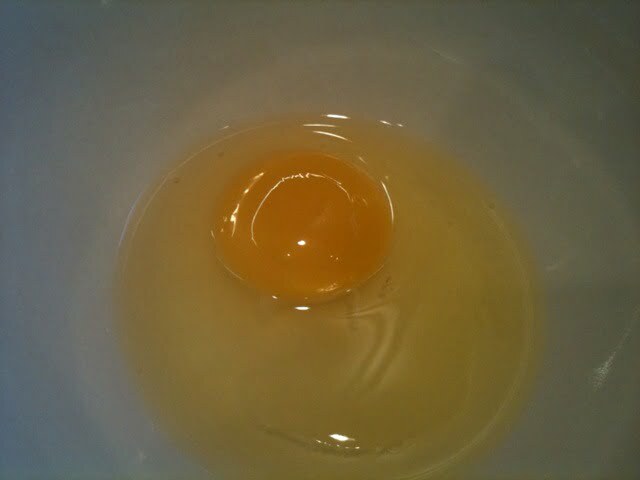 My favorite way these days is to just eat the yolks, which I put (whole) in a glass of chilled raw organic jersey milk. Then drink it down like the actor in Rocky. Don’t even stir the yolks. (There’s no “slimey” eggy texture at all if you remove the white first.) Good times! I’ve never gotten sick from eating or drinking a raw egg and don’t expect to. Of course there’s a chance, but I’ll risk it. Like you say, every activity, even staying home hiding in your house with the doors locked, has risks. Two things to be cautious of: 1) like you say, only use pastured eggs from a farmer you can trust. I emphasize the trust part. I bought some “pastured eggs” at a local farmers’s market a couple of weeks ago which the person selling them said were pastured, brought them home and found that they had thin shells, and weak, runny, pasty yellow-white yolks that broke easily. Real pastured eggs, in my experience, have strong shells and vibrant yellow-orange yolks. The experience has made me cautious about buying eggs from unfamiliar sources in the future. They cost a lot, making me suspect that this person had bought some Safeway eggs for a buck a carton and was selling them for $8, making a $7 profit, by claiming they were pastured. Thanks for the excellent and very informative post! Having said that, I just had a few issues that I thought were misleading in your article. (N.B. I’m a scientist, so I am likely to be overly pedantic!) You mention the chance of an egg having salmonella, which does seem low. However, it’s not really fair to emphasise this chance by comparing it to the “chance of dying of accidental drowning” or the “chance of dying from a slip and fall”; these are not risks that are necessarily tied to frequent discrete events. That is, the risk of contracting salmonella from an egg occurs each time you eat an egg. How often do you calculate the risk of the other two events? Is that every minute? Every second? Every year? Presumably the “risk” of death in these cases is calculated each time you swim, or each time you fall. Given that I fall once every 5 years or so, and I eat a raw egg every week, it’s not really a fair comparison. Also the latter is based on a conscious decision that I make. Also, you justify eating raw eggs “based only on common sense: that’s how they come in nature.” There are countless natural toxins in the world (e.g. cyanide), so this doesn’t really work either. Pete, couldn’t agree more, also thought it was silly to write that the ‘other side’ wants everyone to eat only burnt, dried out eggs. The nutritional value doesn’t seem to change a lot from raw to properly cooked , I believe the current scientific consensus for food safety is 160 degrees F. People calm down a little, common sense can prevail. And I also wanted to ask that is it better to have it cooked or raw? I appeciate the information given above. I never had any problems in having whole raw egg in the morning since I watched Rocky Balboa [lol] but now I’m concerned whether I should have whole raw egg or only the egg yolk??? Ok, raw whites have avidin, my question: Is this true for pastured eggs? If the nutrition in yolks is different, couldn’t the nutrition in whites be different too? In nature various animals love to eat raw eggs. Common sense says, either they are immune to the effects of avidin or nature’s eggs don’t have the same effect. Have any studies been done on pastured eggs in this area? I start with almond milk and thenI love packing baby spinach in my smoothies. You can’t even taste it. Sometimes I add avocado which makes it creamier. My current fave thing to add is (lots) watermelon. Then, add all the other goodies like EFA oils, eggs, yogurt, coconut oil ( I love that it gets firm and the blend leaves it in tiny little chips) Sometimes, I add bananas, blueberries and peaches, mango, etc. but it is just so good without. I drink raw milk, but I’m still paranoid about eating raw eggs. For one thing, we don’t have ready access to good quality eggs (read: cannot possibly afford to spend $4/dozen on eggs). But I’m pretty sure some friends of ours with a small flock of chickens had salmonella in their flock when I was younger. And I don’t think that Mr Kustes’ number comparisons really equate. No, we’re probably not talking about death. But neither are we talking about eating a single egg. If the chances of an egg’s being contaminated are 1 in 20,000 and you eat 1,000 eggs, that’s a lot more chance of eating a contaminated egg than 1 in 20,000. Eating raw eggs don’t bother me at all, I always eat my eggs over easy (runny yolk) and my absolute favorite ice cream contains raw eggs. But I am glad to hear that there really is no risk. Oh, and one more note: The eggs from my neighbor’s chickens are that dark golden/orange described by Melissa. And Kelly’s comment is important: you must know where these eggs come from. Just buying “free-roaming organic” eggs at a supermarket is no guarantee of animal’s health. I see the chickens almost daily and I know how they are kept and what they eat. When they are not laying, and we have to get eggs from the store, we don’t eat them raw! I was severely underweight when I was growing up and at a physician’s suggestion my mom gave me a milkshake along with my breakfast every morning for years through my teens. She always put in a raw egg! I can’t remember ever getting sick from it, and I really enjoyed the taste. So much that when I had a milkshake without an egg, it just did not taste right! And although I can make a Caesar salad with yogurt instead of raw egg, the salad is tangy and better with the raw egg. But perhaps I, too, will use only the yolk from now on. It would probably make the dressing creamier. So if I make a recipe that calls for egg yolks (like ice cream, etc. ), should I throw out the egg whites instead of saving them to add to scrambled eggs or oatmeal? I chuckled when I read “healthy pastured chickens.” I call them “happy chickens.” Great article. I drink the following frequently. If you want to kick it up a bit, add 1 tsp of cocoa and a drizzle of maple syrup or raw honey. I love raw eggs, but mostly because of the yolk. I go through about 5 dozen a week. Lately, I’ve been eating mostly raw yolks and save/put the whites for cooked dishes. I hate wasting the whites and like the thought of still keeping the egg a whole food. I feel like I’m working the system this way. LOL! Raw eggs are definitely on my list of top nourishing foods. The fact that we don’t eat raw liver is just another important reason to eat raw yolks instead. Fortunately my kids love fried eggs with an uncooked yolk, so we eat those regularly. I also “sneak” raw yolks into yogurt, smoothies and peanut butter when I can. Like the others, I can’t imagine wanting to eat them on their own, but it wouldn’t bother me IN things. I sometimes eat a raw egg smoothie (Nutiva Hemp Shake, 3 raw eggs, and coconut milk). You can not even tell that they are in there. It tastes delicious and gives you a real energy boost. I don’t worry about the avadin and just figure it’s how nature intended. I never would have even considered trying them until seeing Mercola do a few articles on how you couldn’t even tell they were in your smoothie. I’m glad I tried it! Some days this is a quick way to get my breakfast in and it is great for hotel breakfast options when traveling as well (that is if you have a refrigerator and can bring stuff from home or pruchase at a health food store where your staying). I always enjoy a post workout smoothie made from raw milk, yogurt, a raw egg yolk and some berries. It’s also a great breakfast on the go. @Soli: I’ve heard of traditional Spanish families giving their children “omelets” the same way–just raw egg yolk and a pinch of sugar. The more I cook, the more I appreciate raw and runny egg yolks! Yum. I ate raw eggs all the time in cookie dough as a kid – Mom not only didn’t stop me, but encouraged it. As an adult, I didn’t eat raw eggs until I went to Japan, where it’s traditional to dip sukiyaki in a raw beaten egg. It was tasty, so I keep doing it. Otherwise, I generally only eat raw or lightly cooked yolks in Hollandaise sauce or poached/sunny side up eggs. And I never really liked the whites, so I usually avoid them anyway, and leave them on the plate. Now I don’t feel quite so bad about that! I am reading this while drinking my smoothie which includes two raw egg yolks, from pastured eggs we get from a friends’ farm. 🙂 I have avoided the raw whites for a while now because I had heard about the avidin. My kids LOVE sunny side up eggs with a runny yolk – makes me so happy! i always learn something new here, the avidin link i hadn’t heard of. i don’t currently eat any raw eggs, but love love love soft cooked yolks and have been serving soft boiled eggs, poached eggs, and eggs over easy to my boys since they were babies. we all love egg juice soaked in toast, on top of greens, to dip bacon in! this is inspiring me to make mayo from scratch, i bet it tastes amazing. This reminds me of a treat my mom told me about from her youth growing up in Sweden. She and I used to do this when I was young but it’s been a long time, maybe now I can get her into it again. Take one egg yolk, beat with a small amount of sugar, and drink. That’s it. Now that we have pastured eggs I really want to dig in! Really, I don’t “worry” about it one way or another. I just make my decision and move on. Fascinating info about the raw whites! I find it really interesting that most of the recipes I have requiring raw eggs really only USE the yolk – mayo and ice cream being the best examples and I have seen egg nog go both ways. Great post, Kelly! It doesn’t gross me out at all. I grew up loving runny eggs. I always cook scrambled eggs for my daughter and it makes me realize I need to make her runny eggs like my mom used to — at least some of the time — so she gets used to it. I really think exposure is the key to being open to new foods. @Mary – I love your idea of eating a raw egg yolk in milk. I’ve been putting a raw egg yolk in my toddler’s chocolate colostrum. Esp. when she’s picky and not eating her meals — and when she’s under the weather. She can’t taste it at all and I feel good knowing she’s getting some solid nutrition. I eat a raw egg yoke along with a cup of raw milk every morning. Its a 1-2 punch of nutrition and gives me an instant burst of energy- like I swallowed a mini-sun:) Does a body good! Not everything is less nutritious when cooked. Sally Fallon talks a lot about cooking grains way longer than they need to be to increase nutrition. So it IS ok to eat raw cookie dough again!!! Yipeeee. 🙂 It is so interesting to see the battle with eggs continue – first eggs are healthy – then they aren’t – then the yolks are bad – and now the yolks are good. I grew up eating sunny side up eggs with the yolks being only lightly cooked and I’m still alive today – at least I think I am. Not to mention all that cookie dough! So it is good to hear even with “normal” eggs salmonella is a little over hyped. Plus I would have to agree if you eat organic free range eggs they must be better anyway. I eat raw eggs in stuff, like ice cream, but not by themselves. It doesn’t really bother me, I just don’t do it otherwise. We have almost decided to raise our own chickens starting this spring. Being able to eat the raw egg yolks could be the deciding factor! I can’t wait to make homemade mayonnaise; it’s so hard to find healthy mayo in the store — even the Organic Trader Joe’s mayo contains soybean oil. We enjoy raw egg quite a bit – though we never eat the white raw due to the avidin. We also store our eggs at (gasp!) room temperature! I really like it in mayonnaise, ice cream and smoothies. Great ways to eat raw yolk without trying to gulp them down straight. I am not opposed to eating raw eggs in food, as Kelly describes. However, I question some of the comments by the quoted author. Many organic eggs are raised the same way as conventional eggs, so the cramped conditions of the chickens could still promote bacteria. Also, pastured chickens that have a small pasture and lay their eggs in droppings all of the time could still be infected. So I would alter the recommendations to say that I’d only consume raw eggs that I’d either raised myself or been to the farm. 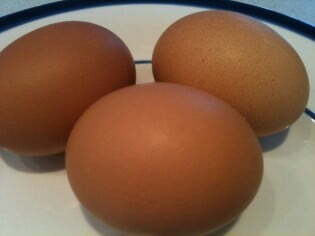 You can really tell the difference between a farm fresh egg from pastured chickens and the store-bought kind. I was so surprised when I first cracked an egg in Tunisia and it came out with a bright orange yolk –it tasted so cheesy without even adding any cheese! I think if we had this image in mind, instead of the goopy white yolks most of us are used to from the States, we might not be so grossed out by the idea of eating them raw.